During the weekend's Japanese Nintendo Direct broadcast a new Dr. Mario title was released for the 3DS; today's Nintendo Direct Micro has now brought the news that this title is pretty close to release in the West, too. 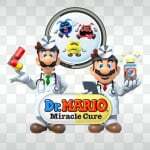 Called Dr. Mario: Miracle Cure, it's getting released in North America and Europe on 11th June. As detailed over the weekend, this incorporates a range of modes with 'classic' Dr. Mario, Dr. Luigi and the touch-screen match-three Virus Buster option. The Miracle Cure item is the main addition, which generates various powers once a gauge is filled; some clear all viruses of a certain colour, clear a row or act as a bomb. There's local and online multiplayer in which you can also disrupt opponents with items - this can be disabled, too. Like Dr. Luigi on Wii U this title offers online and local multiplayer, which is certainly welcome, while Download Play is an option. The Virus Buster game even has a co-op mode. For fans of the puzzle series it certainly seems to have a lot to offer; we'll know soon enough whether it's the puzzling cure we've been waiting for. I'm definitely going to buy this. I missed out on Dr. Luigi, so will purchase this instead. Meh...I would buy it if it had a story mode, or some kind of challenges like in NES remix. So... isn't this named after "Toadley's Miracle Cure" from Mario & Luigi: Bowser's Inside Story? So can we have Dr. Luigi on Smash too? I'm definitely gettin' this. It may not have a Time Trial Mode or Marathon Mode of some sort, but the Miracle Cure feature makes up for it . I won't be using it all the time, though. @manu0 As much as I want a Story Mode of some sort, Dr. Mario 64's felt tacked-on and repetitive, plus having to be pitted against Wario Land 3's characters felt weird as an addition. 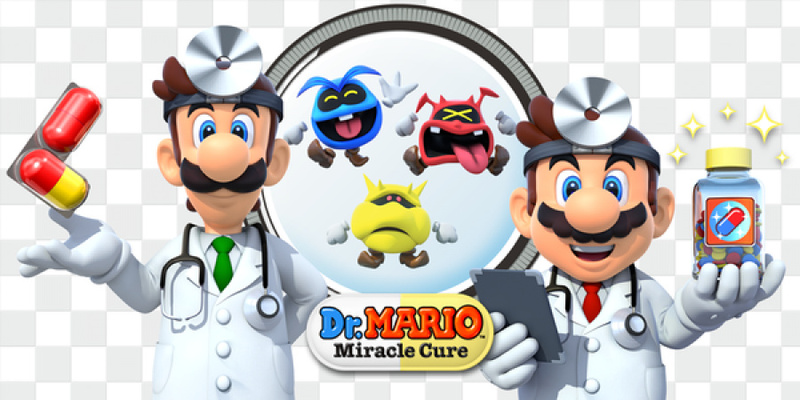 Dr. Mario: Miracle Cure does have a Mission Mode, though and looking at some of its missions, I'm kind of hyped for it. @sinalefa Only if his pills act as a boomerang...given the shape. Play with an Apple device a day, keeps this Mario doctor away. How did this plumber gets a phd anyway? Just pre-purchased this from the e-Shop. So does this take place during Bowsers Inside Story? I'd play it if that was the case. I wasn't sold until they mentioned Download Play, now I have to pick it up. @Zerodactyl but you can still buy Dr. L? or was it removed from eShop?? I loved the SNES version but I was disappointed by the Wii version. I didn't get Dr Luigi (too expensive for what Nintendo was offering) but I'll get this one just to have Dr Mario/Luigi on the go. Plus, the 3DS version looks like it's the definitive edition this far! That could be fun, and would set him apart from the other Dr. and the other Luigi. I think it costs 880 yen, that is around €6.50, but how much will it cost in Europe? I'll probably pick it up the week after. After playing Dr. Luigi, I'd be willing to play a portable version. @VanillaLake Around £4.60 in the UK. @Uberchu It is still available on the eShop, but I didn't buy it. I think there was a discount or something like that, but I can't entirely remember. Or maybe that was a different game. Either way, I didn't buy Dr. Luigi, so I'll be buying this. This looks to have enough to pull me in since I've never owned a Dr Mario game before......so long as the price is right!! Still, this is great news. Download Play makes this a must-have. It's such a pity that so few 3DS games have this feature. Dr. Mario 64 seems like the definitive version to play, at least if local multiplayer works for you. It's just so great. Nintendo will probably release that on the Wii U soon anyway. If he was my doctor, I'd go elsewhere. His lack of medical training terrifies me. Looks just as fun as ever, but I'll wait for the reviews to come out. I still need to play Dr Luigi seeing as I got it for free through Club Nintendo and though I usually prefer puzzle games like this on my handhelds I think I will give that one a go before I even consider purchasing this. I'm pretty excited for this game for some reason. Dr. Mario gets a new game after being playable in Smash Bros. I love me some Dr. Mario. I'll buy this just to have a recent version on 3DS. Nice that they got to old virus's back, but would be nice if you could switch around with the Dr Luigi ones, also would be nice to use mii's again. I hope this comes to a retail Best of the eShop collection box one day. I wonder if they’ll pull Dr. Mario Express (DSi) from the e-Shop. Would it be confusing having two Dr. Mario titles that are so similar (plus the Game Boy Virtual Console port)?